Tip o' the Tin Lid..
After a bit of trouble and being off for a while, big PC died and this "laptop" needed a external drive to handle it, I'd got back in... Running the Koenig today trying to gain points for a cruiser upgrade. Long story short: a run of bad luck, literally. 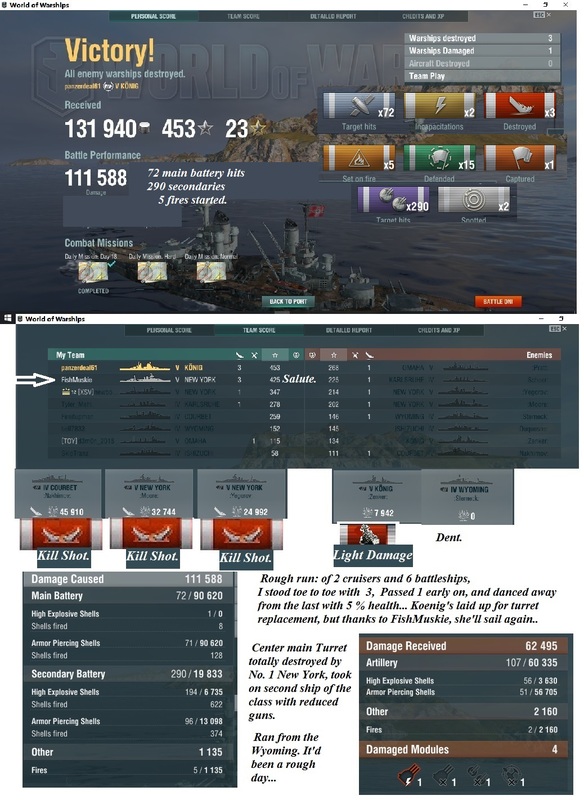 DD's and Cruisers racking up kills all over, and me not able to keep up. Then I got a gift..battleship heaven. @ Cruisers and 6 battleships per side. Ended up fighting 3 duels, bagged a Courbet and 2 x New York...but got hurt in the process, and a Wyoming bearing down on me. Thanks to FishMuskie, who, In a New York, and with about half it's HP left, got that bruiser off my tail. Hope to repay the favor, and don't mind who knows it. Bout the only way I have to say "Thanks" is here. One heck of a fight, right down to the 3 minute mark.. Tip O' Th' Tin Lid. NOTE : Typo..should read 2 Cruisers and 6 BB... hit the shift button. OOPS.